Hot on the tail of yesterdays fine example of journalism from the Oman Tribune, today's edition of the Muscat Daily actually features some real local news, and a specific issue that is often talked about in hushed tones but never before (that I know of) covered publicly by a local paper. 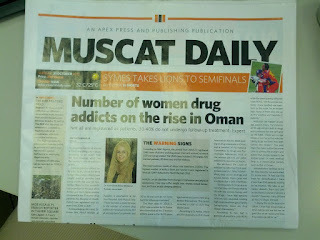 The growing drug problem in Oman. It's worth a read if you see it today. Bravo. Saleh al Shaibani wrote a piece in the same paper a few weeks ago about the drug problem in general. I'm guessing he had some angry feedback hence "our correspondent" as the tagline on this one! Well the issue has been covered for quite a long time in Arabic newspapers. If only these media agencies actually exchange information between each other, this problem would have been addressed sooner. 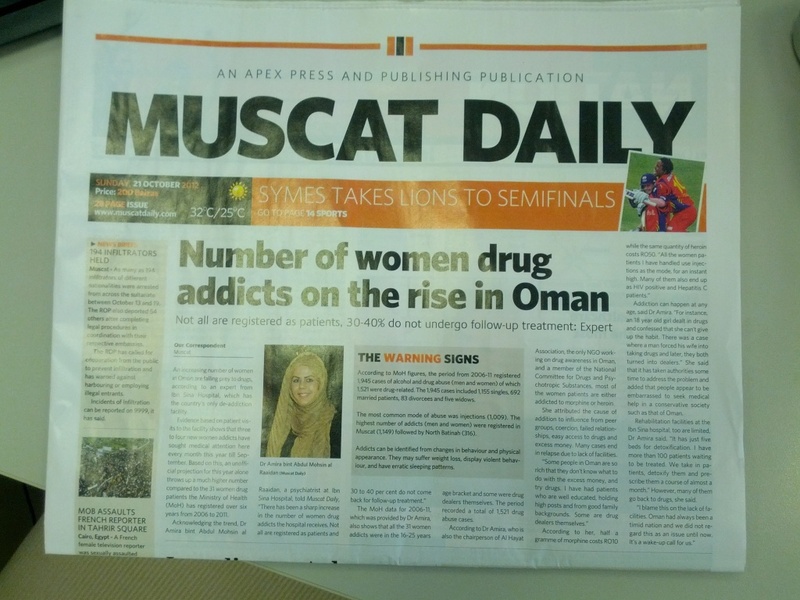 There have been so many stories of drug addiction in the Omani media over the past few years. Also, 'correspondent' usually means 'press release'. Rummy- Watan and Tribune don't talk to each other, never mind Observer and Daily or ToO and Shabiba! I hope this sets a precedent that truth can be exposed without a social splashback. Yeah. all the female teachers I know expressed worry about this but I was like, really? So much trouble in the girls' schools? I still blame parents. You should know what your children are up to, at school and out and who their friends are. I know one paper where they use 'Our Correspondent' in their 'investigative' stories to protect their writers from being sued at the drop of a hat or if they are expats (threatened to be put on the next flight home). To the uninitiated, let me explain: It is pretty easy to file a case in Oman suing just about anyone for defamation. And according to the legal system here, a case of defamation is a criminal case with jail time and fines in case of a conviction. (It is not a civil case like many other places in the world). Visiting the public prosecution's offices and the courts repeatedly to fight a case over a period of two to three years is no fun at all especially when you know that your facts (and hence the story) are right and people are just misusing the legal system to harass you. And journalist's notes and audio recordings are not accepted as proof by the legal system. Which means to prove your case you probably have to break into a safe in a govt or corporate office and actually steal the documents needed. And oh, they also need the guilty to sign the document you just took from his safe and put the company/office stamp on it and put a line below saying "I'am guilty of xyz crimes" before it may be accepted as legal evidence. Can't prove your story with actual documents - sorry we need to lock you up! By using Our Correspondent the legal liability is straight away transferred to the Editor in Chief (who is usually prominent/influential enough to frighten off the average law suit filer) and has deep pockets to fight the case in the courts with the help of the best lawyers in town. Needless to say, the Editor in chief (can only be Omani nationals according to the law here) has to be a man of enough conviction and courage to let his editors and writers publish hard news stories in his newspaper.